Introduction: With the introduction of calcium silicate materials, pulp capping procedure has been simplified due to their therapeutic pulp capping capabilities and ability to be used as a provisional bulk restorative material simultaneously. The quality of the adhesive bond between these cements and composite is of clinical significance with regard to the longevity of the final laminate restoration. Thus, this study aims to compare the in vitro microtensile bond strengths of resin composite to different calcium silicate cements versus glass ionomer cement (GIC). 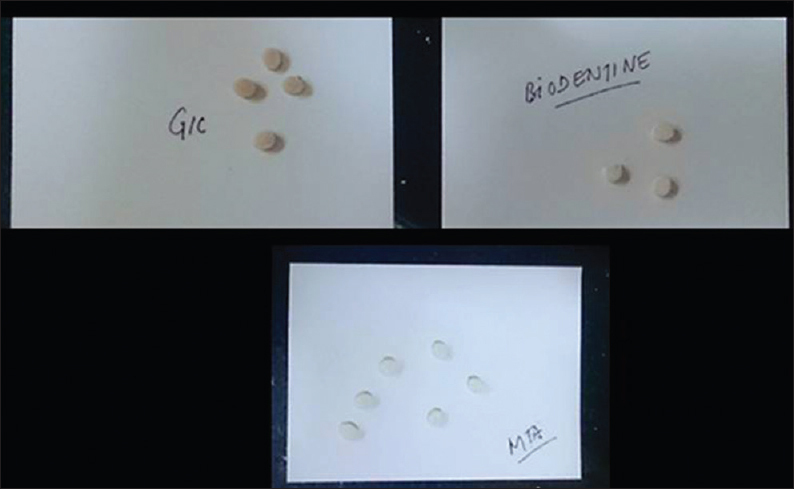 Materials and Methodology: Resin composite was bonded to standardized disks of Biodentine, mineral trioxide aggregate (MTA), and GIC. The samples were divided into the following three groups, and each group was further divided into two subgroups based on the aging time (1 and 2 weeks) of the samples: (1) Group 1 – phosphoric acid etching on Biodentine. (2) Group 2 – phosphoric acid etching on MTA. (3) Group 3 – phosphoric acid etching on GIC. After bond aging, the microtensile bond strength was analyzed using the Instron universal testing machine. Results: There was no significant difference in micro-SBS between 1- and 4-week bond aging of MTA and Biodentine group, while a significant decrease is seen in the GIC group. Conclusion: Calcium silicate cements are weak in the early setting phase. Thus, placing the overlying composite is best delayed for at least 2 weeks to allow adequate maturation of the material. The operative treatment of deep carious lesions approaching the pulp and the related histopathological dentin-pulp complex changes pose a significant challenge as an increased risk of pulp exposure reduces the overall predictability and long-term success.,, Treatment modalities should aim to maintain pulp vitality using a minimally invasive, tooth-preserving approach. With the introduction of newer calcium silicate materials to the market, the clinical procedure has been somewhat simplified by combining its therapeutic pulp capping capabilities with its ability to be used simultaneously as a provisional bulk restorative material. The quality and durability of the adhesive bond between calcium silicate cement and the resin composite are of clinical significance with regard to the longevity and predictability of the final laminate restoration. As Biodentine has a similar chemical composition to mineral trioxide aggregate (MTA), hydration of Biodentine should resemble that of MTA. Therefore, it is assumed that when Biodentine is exposed to a low pH such as that of phosphoric acid etch, this could affect the chemical setting of Biodentine by disrupting the hydration of tricalcium silicates resulting in weakening of the setting material's microstructure.,, Milder etching for a shorter period may cause a selective loss of matrix around the crystalline structures with minimal loss of cement, exposing these crystalline structures and hence encouraging successful adhesion through micromechanical retention. Currently, placing the veneering restoration is a two-stage clinical procedure, completed ideally within 6 months of placing the initial calcium silicate cement bulk restoration, as per the manufacturer's recommendations. However, investigating the potential for bonding the veneering restoration at the same visit as placing the calcium silicate cement is worthwhile as this would be easier and less time-consuming, eliminating the need to bring the patient back for a second visit. Thus, this study aims to compare the in vitro microtensile bond strengths of resin composite to different calcium silicate cements versus glass ionomer cement (GIC). The null hypothesis is that there is no difference in the in vitro microtensile bond strengths of resin composite compared to different calcium silicate cements versus GIC. In this study, two calcium silicate cements, i.e., ProRoot MTA and Biodentine, and GIC were used. The sample size was selected to be 30 (n = 30). These materials were mixed according to the manufacturers' instructions, which were then packed into Teflon rings (5-mm diameter and 2-mm high) for standardization [Figure 1]. 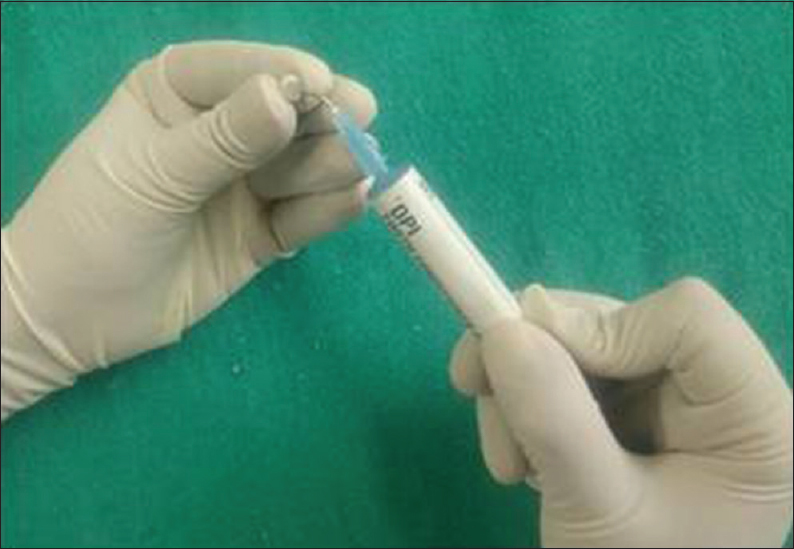 The adhesive resin used in the study was Te-Econom (Ivoclar) which was bonded to the sample disk using total etch technique [Figure 2]. It was cured according to the manufacturers' instructions. Then, the substrate aging was done for 1 week according to the previous studies done. All specimens were stored in distilled water at 37°C for 24 h before testing. A shear force was applied at a crosshead speed of 1.0 mm/min until debonding occurred. The micro-shear bond strength (SBS) (t) is calculated in MPa using the equation t = F/(R 2), where F is the applied load at failure and R is the radius of the resin composite cylinder. Descriptive statistics was used to summarize the study characteristics and bond strength for various materials. Percentages were used to present the failure modes for different substrates. Linear regression models were used to test the significance of various predictors. Significance was predetermined at P = 0.05. When comparing the micro-SBS between MTA, Biodentine, and GIC, the micro-SBS was the lowest for GIC after a bond aging interval of 4 weeks [Table 1]. There was no significant difference in micro-SBS between 1- and 4-week bond aging of MTA and Biodentine group, while a significant decrease is seen in the GIC group [Figure 3]. Currently, there is limited information in the literature on the interface between Biodentine and the overlying adhesive restoration. 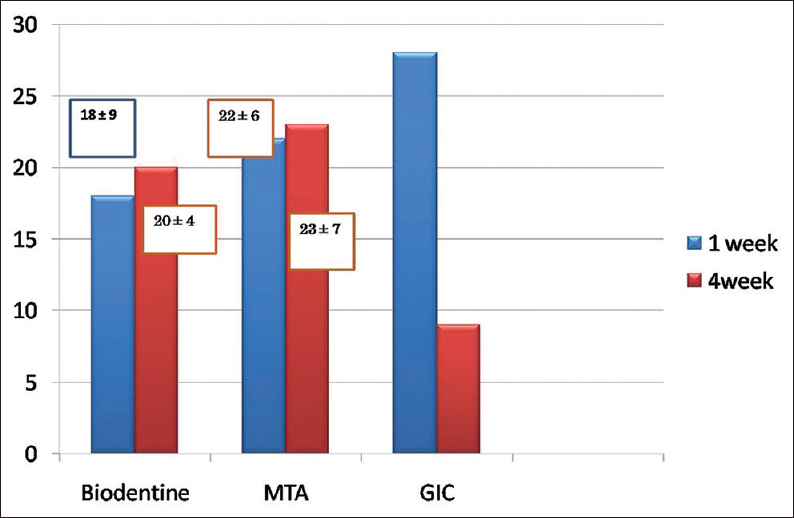 When comparing the micro-SBS between Biodentine, MTA, and GIC, the micro-SBS was the lowest for GIC and the highest for MTA. Due to the lack of chemical union between GIC and resin composite, the measured micro-SBS of GIC would reflect the degree of micromechanical attachment. It is unknown whether a chemical union exists between Biodentine and the overlying resin composite restoration; however, previous research found the functional monomer 10-methacryloyloxydecyl dihydrogen phosphate (MDP), present in the adhesive used in this study, to bind to calcium in tooth structure. Theoretically, it could be assumed that the 10-MDP monomer may bind chemically to the calcium in Biodentine hence promoting chemical adhesion in addition to micromechanical attachment. With regard to aging the substrate, lower micro-SBS values were found in the early compared to the delayed aging of the Biodentine and MTA group. Clinically, this finding should be viewed with caution as this would affect the decision to place the overlying resin composite restoration immediately because the curing contraction of the resin composite may stress the weak Biodentine and MTA in this early sensitive phase resulting in premature failure. Indeed, this is important clinically as these cements are placed in cavities with a higher C factor as opposed to bonding to one surface which was done in this study. This would highlight the importance of leaving Biodentine and MTA to mature for a longer period before the application of the veneering restoration. It takes up to 2 weeks to achieve complete maturation of Biodentine and reach its maximum physicomechanical properties. Therefore, clinically, it would be better to leave the material to set for 2 weeks because, in addition to the reason stated previously, a follow-up appointment would be required as part of efficacious clinical practice to allow monitoring the pulp vitality/response when Biodentine is used to treat such deep carious lesions, affecting the pulp. Biodentine passes through an initial setting reaction which takes approximately 12 min following mixing the powder with the liquid where a hydrated calcium silicate gel structure is formed which has weak physicomechanical properties. The surface set is achieved at this stage. There is the continuous maturation of Biodentine where crystallization of the calcium silicate hydrate gel structure continues for up to 2 weeks. Bulk set is achieved at this stage with improved physicomechanical properties. In a previous study, it was shown that the effect of the bonding technique on the reliability of the bond strength of resin composite to Biodentine, GIC, and resin-modified-GIC was not significant. In the same study, it was found that lower SBS values were found in the early compared to the delayed aging of the Biodentine group. When considering the effect of aging the bond on the SBS values of Biodentine and MTA, no difference between the different time intervals was found. This is a favorable result as this means the bond does not deteriorate with time up to the 1-month study test period. There was a significant difference in the GIC group, which means that the bond between GIC and the resin composite deteriorates with time. Bjørndal L, Reit C, Bruun G, Markvart M, Kjaeldgaard M, Näsman P, et al. Treatment of deep caries lesions in adults: Randomized clinical trials comparing stepwise vs. direct complete excavation, and direct pulp capping vs. partial pulpotomy. Eur J Oral Sci 2010;118:290-7. Barthel CR, Rosenkranz B, Leuenberg A, Roulet JF. Pulp capping of carious exposures: Treatment outcome after 5 and 10 years: A retrospective study. J Endod 2000;26:525-8. Dammaschke T, Leidinger J, Schäfer E. Long-term evaluation of direct pulp capping – Treatment outcomes over an average period of 6.1 years. Clin Oral Investig 2010;14:559-67. Zhang Y, Burrow MF, Palamara JE, Thomas CD. Bonding to glass ionomer cements using resin-based adhesives. Oper Dent 2011;36:618-25. Giuliani V, Nieri M, Pace R, Pagavino G. Effects of pH on surface hardness and microstructure of mineral trioxide aggregate and Aureoseal: An in vitro study. J Endod 2010;36:1883-6. Kayahan MB, Nekoofar MH, Kazandaǧ M, Canpolat C, Malkondu O, Kaptan F, et al. Effect of acid-etching procedure on selected physical properties of mineral trioxide aggregate. Int Endod J 2009;42:1004-14. Lee YL, Lin FH, Wang WH, Ritchie HH, Lan WH, Lin CP, et al. Effects of EDTA on the hydration mechanism of mineral trioxide aggregate. J Dent Res 2007;86:534-8. Available from: http://www.ivoclarvivadent.in/en-in/p/all/products/restorative-materials/composites/te-econom-plus. [Last accessed on 2017 Oct 20]. Hashem DF, Foxton R, Manoharan A, Watson TF, Banerjee A. The physical characteristics of resin composite-calcium silicate interface as part of a layered/laminate adhesive restoration. Dent Mater 2014;30:343-9. Chadwick RG, Woolford MJ. A comparison of the shear bond strengths to a resin composite of two conventional and two resin-modified glass polyalkenoate (ionomer) cements. J Dent 1993;21:111-6. Yoshida Y, Nagakane K, Fukuda R, Nakayama Y, Okazaki M, Shintani H, et al. Comparative study on adhesive performance of functional monomers. J Dent Res 2004;83:454-8. Bachoo IK, Seymour D, Brunton P. A biocompatible and bioactive replacement for dentine: Is this a reality? The properties and uses of a novel calcium-based cement. Br Dent J 2013;214:E5.